Lori Villegas divides her life into three worlds — her family, her career and making a difference in other people’s lives. 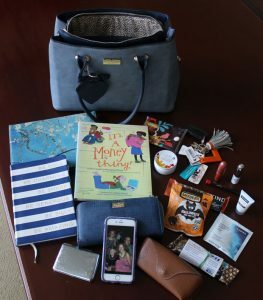 That’s evident in her purse as she has snacks for her children, which she often enjoys, too. She carries her iPad so she can work remotely, and she has a journal in case she needs to take notes while meeting with a client. She also has energy bars, with a United Way business card wrapped around them, that she can give people on the street. Sometimes she also carries a book she uses when tutoring young women. She often involves her children when she volunteers at soup kitchens or other projects because she wants them to understand they can make an impact on others’ lives, too. It’s important to her that she raises her two children to be kind and responsible. Villegas said that when she would read to young girls in schools she discovered a lot of them didn’t have a great sense of self-worth and confidence. She doesn’t always carry the book, “It’s a Money Thing!” with her, but she uses it when she tutors young girls because it’s a great book about money. She said she spends time reading or just talking to children, especially girls, in schools. Villegas has been in her career around 25 years. While the percentage of women that do what she does hasn’t changed much, she wants to let girls know they can understand things like math and finances, too. 1. A Kind bar with a business card for 211 with the United Way, which she is heavily involved with. She gives them out to homeless people instead of giving them money. “It gives them the services and shows a little bit of kindness.” In the winter she sometimes carries gloves she picks up at a Dollar Store. 2. Snacks for herself or her kids. 4. Silver business card holder her mother gave her. 5. Wallet packed with gift card and coupons. 9. iPad in a designed case so she can work remotely. 10. A journal so she can take notes in meeting with clients, for her kid’s school or just thoughts for herself. She liked the words on the cover and also bought her daughter an identical copy. 12. Travel tissues for her kids and herself. 15. “It’s A Money Thing!” book she uses when tutoring young girls.